DEFAULT Masterclass in Residence: On Art, Cities and Regeneration :: September 21-30, 2011 :: RAMDOM Association, via San Francesco d’Assisi 15m, Gagliano del Capo, Lecce, Italy :: Call for Artists – Deadline: July 17. In our current (austere) times, how can we interact with wider governmental policy on regeneration? How do we tackle the increasingly politicised stakes that underpin cultural funding for the revitalisation of urban centres and neighbourhoods? Do artists, curators, art managers and policy makers now default to ‘art and regeneration’ practices which are no longer viable, yet still entrenched in cultural structures, because there no other alternative given? The works will take places in several regenerated spaces in the city of Lecce. Current faculty and lecturers include: Lewis Biggs (Biennale of Liverpool), Celine Condorelli (artist), Andrea Lissoni (Xing and Hangar Bicocca), Manon Slome (No Longer Empty), Alfredo Cramerotti (curator, AGM and QUAD), Yesomi Umolu (curator, AGM), Hannah Conroy (curator, AGM), Andrea Siclodi (Künstlerhaus Büchsenhausen), Ana Hoffner, Paolo Mele (RAMDOM), Filipa Ramos (writer and art critic), Pietro Gaglianò (art critic), Emiliano Paoletti (Bjcem), Chris Torch (Intercult). An international committee of art professionals will then select 10 international and 10 Apulian artists to participate in the masterclass. 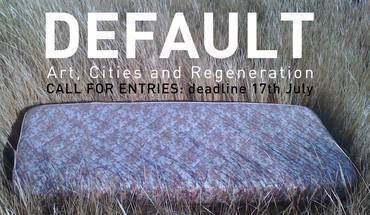 DEFAULT is organized by RAMDOM Association (Lecce, Italy) in the frame of the project ‘Memorable Arts’ and curated by AGM Culture (Nottingham, UK). It is delivered in collaboration with Künstlerhaus Büchsenhausen (Innsbruck, Austria). With the partnership of Sud-Est association (Manifatture Knos), Bjcem (Biennale de la Mediterranée), Fondazione Fitzcarraldo, Arci Puglia, Archiviazioni, Municipalità of Lecce, Lupiae service, Province of Lecce. DEFAULT Masterclass is financed by the Regione Puglia, Principi Attivi 2010 – Giovani Idee per una Puglia Migliore.